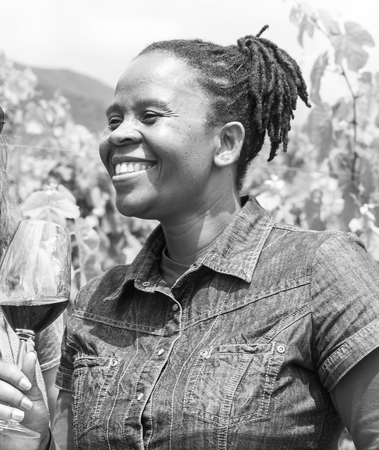 Aslina is a wine company owned by Ntsiki Biyela, the first black woman winemaker in South Africa. She is a highly awarded winemaker, and in September 2017 was named among the Most Innovative Women in Food & Drink, by a joint effort of Food & Wine Magazine with Fortune Magazine. Aslina is the name of her late grandmother who was, and remains, her inspiration. Ntsiki Biyela grew up under her grandmother’s guidance and care. After 13 years of being a winemaker and ambassador of Stellekaya wines, Ntsiki Biyela continued her journey of inspiration by starting her own brand. This followed the collaboration she has been doing with Helen Keplinger for Wine for the World. Ntsiki has consulted in France and has made wine under Winemakers Collection in Bordeaux. She grew up in Mahlabathini, a rural village in Kwazulu Natal, and matriculated from high school in 1996. Having spent a year as a domestic worker, she was awarded a scholarship to study winemaking in 1999. She graduated in 2003 with a BSc in Agriculture (Viticulture and Oenology) at Stellenbosch University and joined Stellekaya the following year. Ntsiki was crowned Woman Winemaker of the Year in 2009 and has been the finalist for two consecutive years for The Most Influential Women in Business and Government. She has received extensive media coverage throughout the world over the course of her career, including features on CNN, the front page of the New York Times, CNBC, SABC, Good Morning America, and more. Finally, she sits on the board of directors for the Pinotage Youth Development Academy, which provides technical training and personal development for young South Africans in the Cape Winelands, preparing them for work in the wine industry. The program offers them the unique opportunity to emulate her own considerable success.